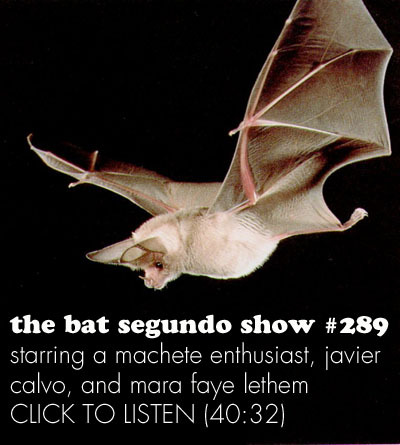 Javier Calvo and Mara Faye Lethem both appeared on The Bat Segundo Show #289. Javier Calvo is the author of Wonderful World. Mara Faye Lethem is the translator. Condition of Mr. Segundo: Considering the unseen cantaloupe. Correspondent: I must ask then, Mara Faye, if you had read any other books to get the idiom right in English for this. Because both your translation of this book [Wonderful World] and your translation of Pandora in the Congo strike me as far more specific. It’s almost as if the translation itself can be placed within a neat, genre-specific feel in the prose. And I’m curious if you do it more intuitively or if you actually do, in fact, try and read books surrounding a particular genre or a particular place it might end up. So that it might be more palatable to the English ear. Lethem: No, I don’t do that. I don’t think that that would be fair to the author. I work with the text. And much more so than the author. Even if he’s in the room next door. Because there are two very separate things. The voice I try to pull from the text itself, not from any other text. Obviously, if the author is working with references — as in Pandora in the Congo, with adventure stories and things like that — it should come through in the original. And so I really try to be as faithful to that as I can. I think a mistake in translation can involve feeling that you know more than the author. It’s like a trap. You think, “Oh, I know what he’s trying to say here.” But you sometimes have to be able to say, “Okay, I can make this choice for him.” Because there’s choices to be made. Definitely. Sometimes, there’s the perfect word. And sometimes there isn’t. You know, there’s no one word that means that in English. But I try to avoid anticipating the author. Correspondent: But in this case, what did you do to insulate yourself? Because the author here is in the next room. Did you essentially communicate as minimally or as little as possible with Javier? Or what happened here? Lethem: Oh well, we communicate a lot. Lethem: Often about what we’re going to have for lunch. Or who’s going to pick up our daughter from school. Calvo: I think that the situation where your wife is your translator and you’re living under the same roof — or your husband is the author you’re translating — is a potential nightmare. So it was good that she didn’t really come to me that much or I wasn’t bothering her. And we had some space between us. It’s very easy too to create a professional distance in a question like that. But yeah, it was very good that we didn’t try and work together. And she only came to me when she had an important question or something like that. Because imagine. I think translating your husband’s work might be a pretty good cause for divorce. Potentially. I hoped you would talk to Calvo and Lethem about this book.